Widely regarded as one of the greatest live country albums of the 1960s, 'George Jones Live At Dancetown USA' was part of the Ace catalogue for decades - first on vinyl, then in expanded form on CD. Given the advances in technology since its first digital issue more than 20 years ago, Ace figured it was probably time to upgrade the package with freshly remastered audio (in mono this time, the way it was always meant her be heard, rather than the 2-track of the previous issues with George's vocals on one channel and the Jones Boys' accompaniment on the other), an expanded booklet with a new cover design, a more detailed sleeve note and a new title. 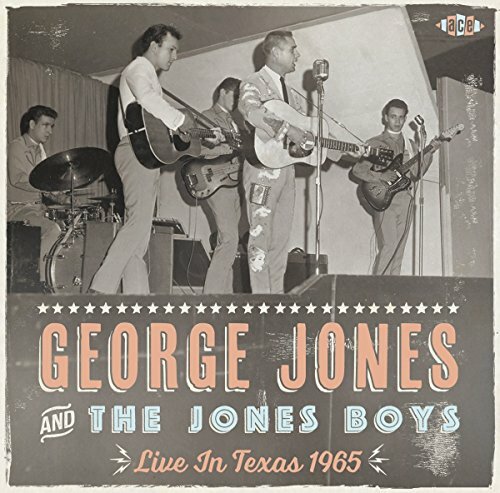 'Live In Texas 1965' remains one of the most authentic examples of a working country musician plying his trade in front of a hometown crowd. As well as energetic and committed performances of some of Jones' greatest hits - frequently shouted for by the very boisterous crowd - you will hear extended solo showcases for various band musicians, singers and guests. There's even a rare attempt at a rock'n'roll classic, a type of music George was never noted for enjoying.